The AERO-Plug SeriesTM is a Aerospace ruggedized redundant N+1 pluggable. 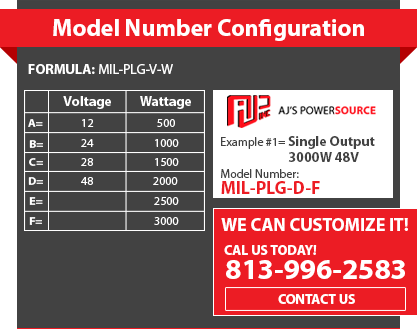 AJ’s Power Source Inc. is pleased to announce the release of our new AERO-Plug SeriesTM. This new power supply has just been added into the AERO-Series Product Line and is a Ruggedized Aerospace compliant pluggable power supply system built for deployment and operations equipment. These units are available to all Aerospace, homeland security and government contractors. They are built for a Very Low EMI signature and very High Reliability. This ruggedized power supply system will keep your product up and running for many years to come. The AERO-Plug SeriesTM is a 1U rack mount, single output voltage, rugged pluggable power supply system that provides up to 1500 Watts N+1 or 3000 Watts non-redundant. Each plug in module has hot swap capability and is field replaceable. It comes with N+1 redundant power or standard multiple outputs. The Aerospace Rugged Redundant N+1 Pluggable Power Supply Has Unique Features Designed to Meet All the Aerospace Standards. Single or Three Phase Options.